Ford’s 5.0-liter Coyote engine and Chevrolet’s LS3 6.2-liter powerplant are two of the key components of the reemerging musclecar era; found in the 2011+ Mustangs and 2010-15 Camaro respectively, these engines are only separated by a few horsepower in factory form. So we began to think if we built budget versions of both, which one would come out on top? 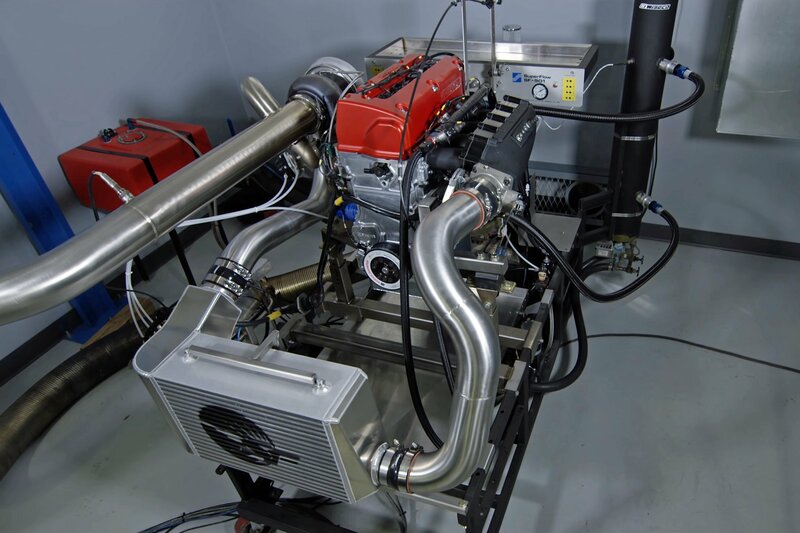 EngineLabs will be conducting the battle between FordNXT‘s Coyote build and LSX Magazine’s LS3. Which one will come out on top? Best part for you readers, we plan to give away prizes for those who guess closest to the actual horsepower and torque numbers for each of these engines! With a build like this, we needed to come up with some qualifying factors. Bowtie fans might say, “Well I could buy an LQ4 for seven dollars and kill that Coyote”. This is very much a Mustang versus Camaro budget engine build off, but with the engines out of the car. Also, the builds needed to be streetcar friendly; a high compression build with radical cam profiles is not as common as a crate engine. We wanted to showcase parts that someone could easily replicate and swap into their vehicle build. These engines–both in all-aluminum form–were built on the same day at local engine builder L&R Engines. From there the engines will move to Westech Performance’s engine dynos for our power testing. Both engines were built side by side at L&R Engines and took almost the same time to complete. The price must include intake manifold to oil pan but without accessories, electronics, machining, or assembly costs – just the raw street value of the parts. The engines will be robust enough to support 1,000+ horsepower with a power adder, though we are going to run both of them naturally aspirated. After our internal discussions, discussion with our engine builder, and listening to the input of you, our readers, we’ve determined a set of final testing parameters that will satisfy everyone (we hope). As previously mentioned in the content below this segment, we’ll be monitoring average power across the entire curve, power per cubic inch, and gains over stock reading, which we’re marking as 420 hp for the Coyote and 430 hp for the LS3. Given those initial testing criteria, we’ve also decided to record a number of other things based on input from you, our readers, and our own ideas. Simply put, a brand new, performance-based Coyote engine can’t be built for under $10,000. There’s much more to a Coyote other than the block and two heads–the Twin Independent Variable Camshaft Timing chain drive components really start adding to the price tag. A Ford Racing stock Coyote or Aluminator crate engine is a better starting point, but that would make our selection of modifications rather limited. Views of the Coyote engine and its supporting gear. As a result, we started with an F150 take out long block. You might be saying, “I thought this was a Mustang versus Camaro battle?” The F150 Coyote is considerably cheaper (we purchased ours for $3,000) than a Mustang’s 5.0 engine. When building the engine it’s very easy to “convert” it to Mustang 5.0 specifications. The main differences between the two platforms are the pistons, rods, camshaft profiles, and valve springs. The LS3 is definitely an easier engine to build new. They’re a simple in-block cam configuration and virtually everyone in the aftermarket makes something for LS engines. Chevy Performance and Pace Performance helped out big time by supplying all of the factory-based components. Our winner will be determined by the engine that “wins” the most objective categories. Measurement of external dimensions will not factor into our decision. The LS3 and various components. This short update includes the basic rundown on the required parts for the build. There are a number of items we chose to help provide extra longevity to the engine, especially in the Coyote’s case. The factory oil pump gears are well known for their propensity to fail at the worst time, as are the factory timing chain tensioners. Upgrades are simple and effective. This complexity does not exist in the LS3 engine; sourcing parts and assembly was a bit simpler. In this build, we used a set of 3.640-inch-diameter forged pistons (92.45mm) and stock length, 5.933-inch connecting rods from Manley Performance. This is a slight overbore from the factory 3.629-inch bore (92.2mm) and will add a neglible 1.84 cubic inches of displacement. However, the oversize allows someone building a used Coyote like this one to hone the cylinders to the proper finish prior to piston installation. With the block decked, our compression ratio ended up just a touch higher than stock at 11.2:1. Matched with the factory forged 3.649-inch-stroke (92.7mm) crankshaft–the same found in the Mustang–this became the recipe for our main short block components. For both engines we are using ARP’s main studs and side bolts, along with Clevite coated bearings. (Left) You can't just order a single camshaft for the Coyote; a quad arrangement of lumpy steel is required. (Right) Some of the assembly process on the 5.0-liter bullet. For safety and reliability we installed a set of Ford Racing BOSS 302 timing tensioners along with Triangle Speed’s billet oil pump gears. Since the factory Coyote heads work very well, there wasn’t a lot we needed to do there other than install a valvetrain upgrade kit from COMP Cams that comes with new valve springs, tool steel retainers, seats, and seals – sealed up with Ford Racing’s BOSS 302 head gaskets. Also from COMP Cams are their Stage 3 NSR Coyote camshafts. Although the NSR (No Springs Required) camshafts do not require upgraded springs for installation, these were replaced as their history was unknown. Rounding out the induction, Ford Racing supplied a BOSS 302 intake manifold, while fuel rails from Aeromotive and injectors from Deatschwerks are also onboard. The bottom of the engine is fitted with a Moroso oil pan designed for Fox body and SN95 applications. Spark is provided by MSD’s ignition coils. With the help of Chevy Performance and Pace Performance, a production LS3 block became the foundation for our build; we then selected a factory forged LSA crankshaft, which is stronger than the LS3 crank yet remains the same price to the end user. Lunati‘s Voodoo forged H-beam rods that are mated to Mahle pistons that use low-drag 1.0mm/1.0mm/3.0mm ring packs. The pistons were cut down slightly to reduce the compression ratio; once we were done with that modification on the slugs, we ended up with an 11.4:1 compression ratio to put the compression of the LS3 engine .2 points higher than the Coyote. Like the Coyote’s displacement increase, this compression bump will have a minor effect on overall power. (Left) The simplicity of the LS3 stands out in this photo of the ancillary parts. (Right) The bottom end getting buttoned up. The cylinder heads of choice are Chevy Performance’s factory CNC-ported LS9 variants. We chose the ported LS9s over the LS3 heads due to their stronger casting, thicker decks, and intake hump that helps with airflow; the best part of the performance-to-dollar equation is that they cost only $300 more per pair than the LS3 heads. COMP Cams again provided the majority of the valvetrain for the LS engine, including their camshaft with matched spring package, factory-style lifters, push rods, and roller trunnion upgrade for the factory rockers. Induction includes a factory LS3 intake manifold filled with FAST’s 65-lb fuel injectors and rails. Spark is handled by FAST coils and MSD plug wires. The engine is tied together with ARP fasteners, Victor Reinz gaskets, and Clevite coated bearings. Stay tuned as we have the full engine build stories with tons of details coming up next month!